Purchase Your Tickets Before They're Gone! 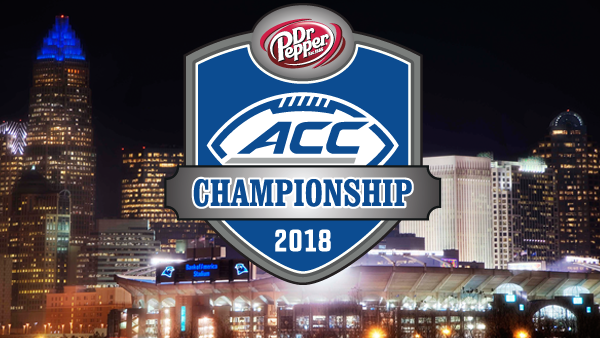 Tickets are going fast for the 2018 Dr Pepper ACC Football Championship Game! The game, now in its 14th year, is set for Saturday, December 1 at 8 p.m. on ABC. 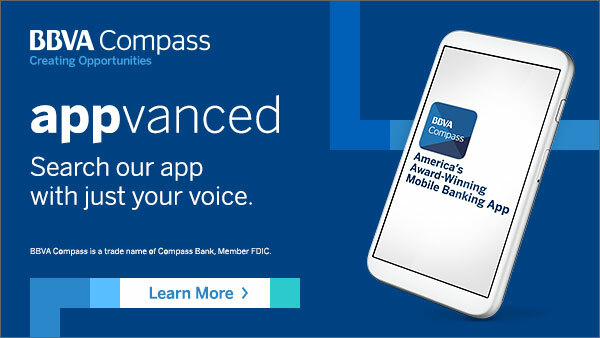 The Dr Pepper ACC Football Championship Game is played at Bank of America Stadium in Charlotte. The game will call Charlotte home through 2030. The ACC Champion, if in the top four of the final CFP rankings, will play in one of the national semifinal games. If the ACC Champion is not in the top four of the final CFP rankings, it will appear in either the Chick-fil-A Peach Bowl or the PlayStation Fiesta Bowl. Register before this Saturday, November 10th, to reserve your school-specific race t-shirt! 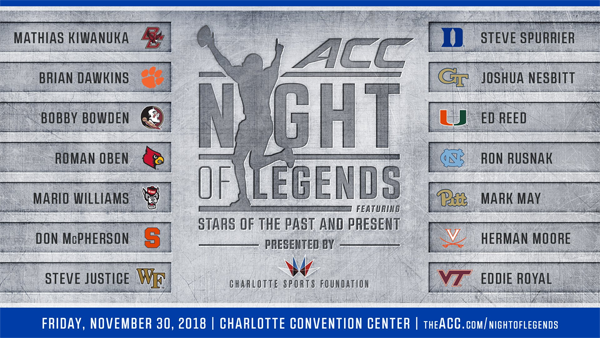 The ACC Night of Legends presented by the Charlotte Sports Foundation will be held on Friday, Nov. 30, at the Charlotte Convention Center. 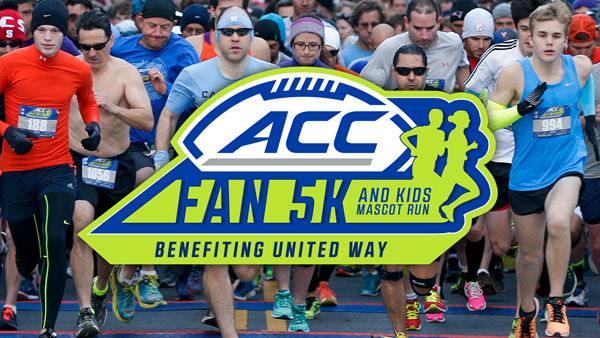 This signature event will recognize a Legend from each ACC football member institution, as well as the 2018 ACC Football award winners. The Night of Legends offers attendees the opportunity to meet some of the biggest names in college football, including all-time coaching greats, hall of fame players, college national champions and Super Bowl winners. A reception will be held from 6-7 p.m., with the dinner beginning at 7:00 p.m. and the awards presentation at 7:30 p.m. Reserved tables and seats for the event are available now. Get Tickets Now for the Belk Bowl, the Best Bowl! Tickets are on sale now for the 2018 Belk Bowl, featuring teams from the ACC and SEC squaring off in Charlotte. The 17th annual Belk Bowl is set for Saturday, December 29 with a noon kickoff and will be televised nationally on ABC. 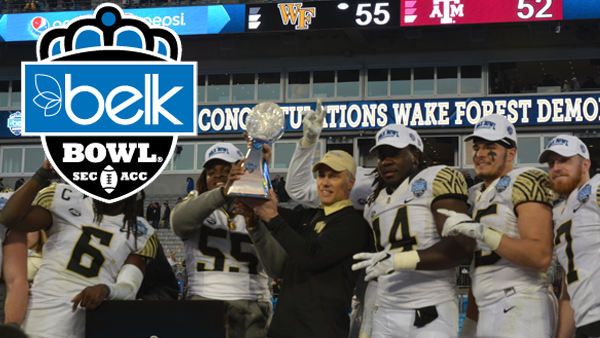 Last year, Wake Forest defeated Texas A&M, 55-52, in what is regarded as one of the most entertaining bowl games from last season, including the College Football Playoffs!